The author acknowledges the encouragement and guidance of W.F. Persinger, Chief, K, during this study. He is also grateful for the extraordinary assistance, helpful discussions and critiques provided by F. Berko (K5), Susan Feibel (K4), C. Goedeke (M2), and Tara S. Vaughan (K409). 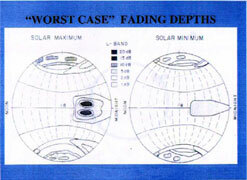 ALL CLASSIFIED MATERIAL WAS REMOVED IN ACCORDANCE WITH N5P6 PUBLICATION REVIEW, MEMO DATED 9 MAR 1999. 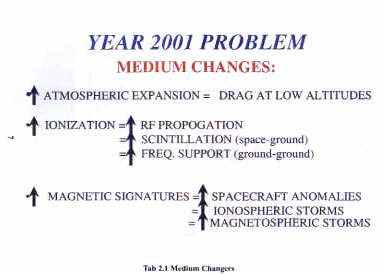 This report is concerned with the year 2001 problem; i.e., the changes to SIGINT by the rising sunspot number which will peak between 2000-2002. The objective of this paper is to provide a brief survey on the impact of the impending sunspot maximum. 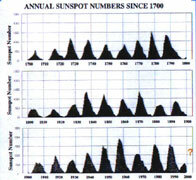 The solar cycle attains a maximum about every 11 years. It has been recorded from about 1700. The mean monthly spot count is shown in Fig. 2.1. The periodic appearance of spots on the solar surface (photosphere) defines a cycle. The number varies from about five to a maximum which may exceed 200. Cycles have been numbered consecutively; the present cycle, No. 23, will peak between the years 2000-mid 2002. 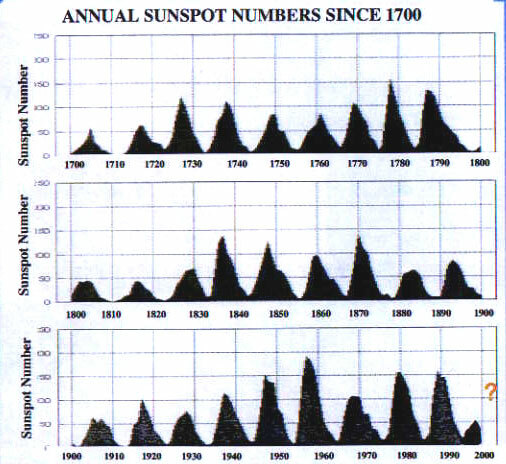 Note that the spot number is only a visual indicator of solar activity; the underlying cause for this cyclic mechanism is still unknown. The first indication of a new cycle is the appearance of spots near solar latitude of 40 degrees. They appear simultaneously at about equal latitudes in both hemispheres of the sun. As the cycle advances the latitude of appearance decreases and asymptotically approaches ~5 degrees in the declining years of the cycle. 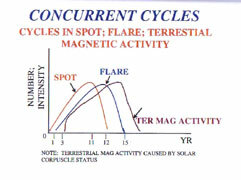 During this period spots of the new cycle may appear so that spots from both cycles are present. 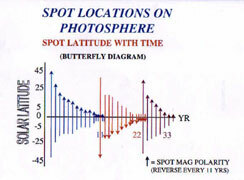 The magnetic polarities of spots in opposite hemispheres are reversed. 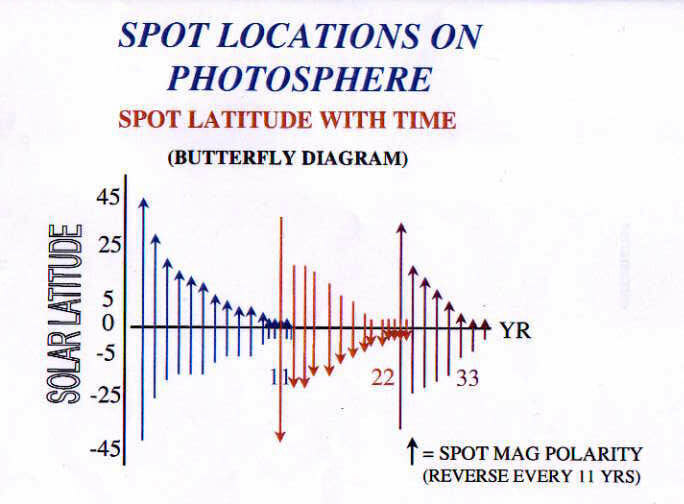 An interesting feature occurs in the succeeding cycle: the magnetic polarities of spots in the northern and southern solar hemispheres become reversed (Fig. A.2). As the cycle rises, the number and size of spots, and the number of flares increase, and their various emissions greatly increase in intensity. Also, the solar atmosphere, (the chromosphere) becomes increasingly violent and turbulent, ejecting into space clouds of material (Chromospheric Mass Eruptions - CME). 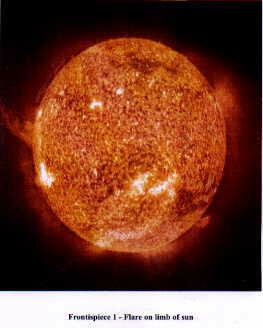 The energy output of the sun is concentrated in the infrared and visible portions of he spectrum. This energy, known as the solar constant, sustains most life forms on Earth and amounts to about one kW/sq m. Energy is also emitted in the Radio Frequency (RF), and UltraViolet and X (UVX), regions of the spectrum. Energy is also carried by outgoing streams of solar corpuscles, particularly by proton jets of high velocity. By way of comparison, the latter energies maximize during peak years of the cycle, whereas the solar constant changes little. The larges amount of energy, on a one-sq/m basis, is for RF, microwatts; for UVX, tens of milliwatts, and for proton jets ~1kW within the stream. The Earth's upper atmosphere is extremely sensitive to UVX and corpuscular radiation and undergoes remarkable changes during peak years of the spot cycle. The sun constantly exudes a stream of corpuscles (electrons, protons, and heavy ions) radially into space. This stream (the solar wind) causes planetary atmospheres and cometary tails to stretch anti-sunwards. Since the solar wind is an ionized plasma it interacts with planetary magnetic fields. The volume around the Earth and Jupiter controlled by their magnetic fields is called the magnetosphere; its surface is the magnetopause. 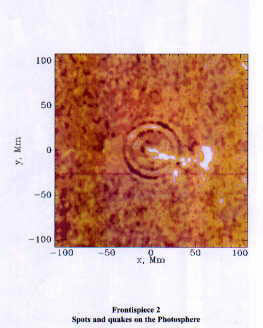 Beyond it lies the solar wind (Fig. 2.2). The solar wind extends to the tail of the magnetosphere on the night side of the Earth to distances well beyond the orbit of the moon (Fig. 2.2). During years of spot maximum the sun emits clouds of CME and energetic proton jets from spots, flares, and the chromosphere. They travel with excess momentum through the solar wind and may buffet, flap, and even compress the magnetosphere. The shock wave of large corpuscular clouds has compressed the magnetopause to within synchronous (~40,000 km) altitudes, causing damage to orbiting satellites. 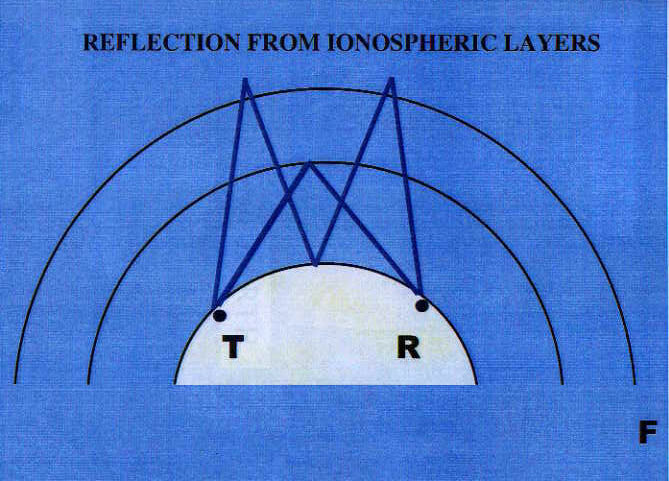 The ionosphere is that portion of the atmosphere where electrons exist in sufficient numbers to affect radio wave propagation. 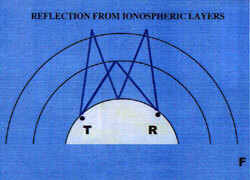 The ionosphere extends from about 60 km to thousands of km. The atomic species change with altitude; in the lower ionosphere the ions are primarily those of oxygen and nitrogen. In the upper ionosphere the gases stratify according to their molecular weight. The outermost reaches contain ions of helium and hydrogen. 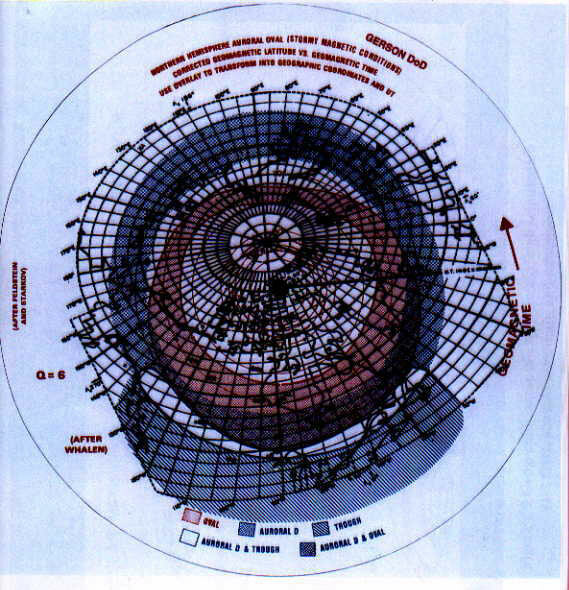 The lower section of the ionosphere contains a number of layers: D, E, F1 and F2 located at nominal altitudes of 80, 100, 200, and 250 km respectively. Sporadic E, a cloud-like layer not under direct solar control also occurs at about 110 km. All other layers are produced and controlled by the sun. In the higher layers where mean free paths are considerable, movement of electrons is affected by the Earth's magnetic field. The D layer may be considered as absorptive for radio frequencies above about 500 kHz, but supportive for propagation at lower frequencies. When the electron content increases the two effects are emphasized. 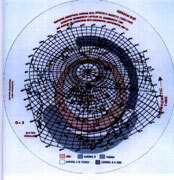 HF absorption increases inversely with the square of the frequency. The upper layers are "reflective"for High Frequency (HF, 3-30 MHz, Figs. 2.3) and Fig. 2.4, more to scale illustrate the location of the layers relative to the Earth. The electron densities of each layer increase with sunspot number thus allowing higher frequencies to be "reflected" during peak years of the cycle (Fig. 2.5). A marked increase in D region electron densities stems from two causes: a) intense bursts of UVX from flares, and b) precipitation of solar electrons into the D region. UVX only affects the sunlit hemisphere and causes a "short-wave fadeout" which persists for minutes to perhaps an hour. The trajectories of penetrating electrons are influenced by the Earth's magnetic field; they may reach the D layer on the night and twilight regions. Further, the more energetic the electrons the more equatorwards they enter the atmosphere, thus producing D absorption and aurora at lower and lower latitudes. The value of the magnetic index Q is an indication of the magnitude of the energetic particle stream intruding into the atmosphere. Figs. 2.6-2.8 indicate the equatorwards progression of aurora and D absorption as a function of increased terrestrial magnetic activity. The auroral associated D absorption can persist for hours, or even days. (To a rough extent, terrestrial magnetic activity is a measure of the energy deposited by solar corpuscular streams into the atmosphere, (see Section 2.3). 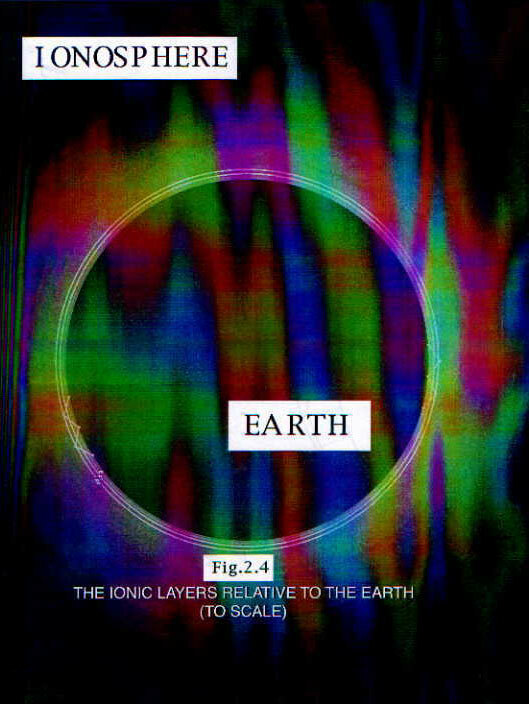 Above the F2 layer the ionosphere still remains a weak plasma with equal numbers of ions and electrons. A radio wave propagating through this region is affected by the Total Electron Content (TEC) it encounters. Since the ionosphere constantly varies with time, the TEC also varies and introduces rapid fading on the phase and amplitude of the wave. This fading is called scintillation. Scintillation is analogous to the twinkling of starlight observed on the ground from stars. Twinkling arises from changing multipath conditions in the troposphere; scintillation for multipath TEC changes in the ionsophere. TEC is a function of the spot number and maximizes during peak years of the cycle. Like D region absorption for HF, scintillation affects lower frequencies most from (30-2,000 MHz). 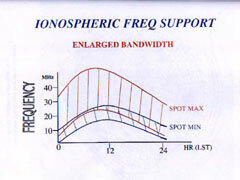 At frequencies exceeding 10 Ghz the ionosphere is transparent and no scintillation is observed. The up- and down-link frequencies of most satellites are still below 10 GHz and thus may be affected during solar maximum. Only satellites launched since about 1994 use RFs>10 Ghz for communications, command, and telemetry. At present many military, GPS, and commencial (INMARSAT) systems still use frquencies below 3GHz (C, X, L bands). Satellite-satellite communications are usually above 10 Ghz. Because of scintillation locations on Earth determined from GPS become less accurate during solar maximum. Scintillation effects increase inversely with frquency below 2GHz. Thermo-electric currents flowing in the molten ferrous core of the interior generate the Earth's magnetic field. At the surface the resulting magnetic poles (about 0.5 gauss) are not diametrically opposite. All spherical harmonic analyses, using surface and spacecraft observations, indicate that the field is primarily dipole in nature. The derived geomagnetic (dipole) field is employed in most computations and usually is considered to be located at the center of the Earth. Over 98 percent of the field arises from the internal electric currents. All major fluctuations, which may attain one milligauss, arise from electric currents external to the planet. On a cosmic basis the Earth may be considered as a spherical magnetic embedded in flowing ionized plasma, the solar wind. 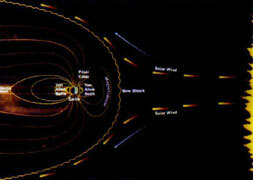 On the sunward side, the field lines are compressed by the solar wind, but still retain their dipolar shape. 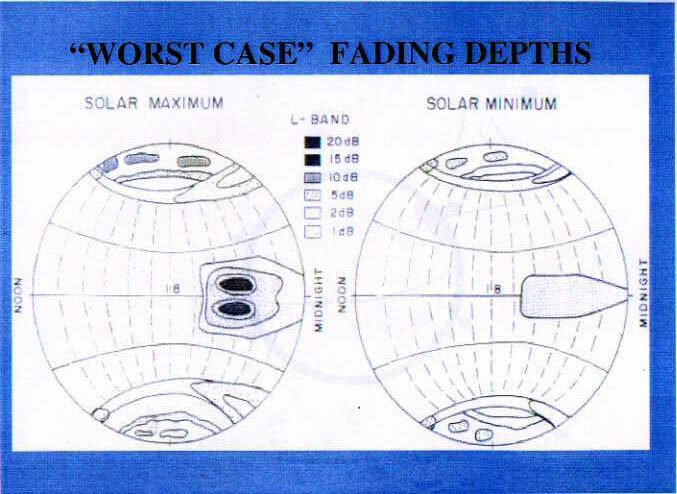 However, the ionized solar wind interacts with the field and at some latitude drags the field lines far into the night side of the planet - to distances of about 100 earth radii (See Fig. 2.2). Between the closed field lines on the sunlit side and those drawn anti-sunwards is an opening called the "cusp". 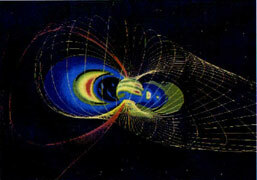 It may be considered as a magnetic funnel, which allows solar corpuscles to more readily enter the magnetosphere. A variety of terrestrial magnetic effects, each arising from a different cause and having its own distinct signature originate from the interaction of the interplanetary clouds and the Earth's field. For example, the shock wave of the cloud may compress the magnetosphere or cause it to flap and fishtail in the solar wind. The corpuscular material can generate large electric currents flowing within the ionosphere in polar and equatorial regions (auroral and equatorial electrojets); or induce large sheet currents from auroral to equatorial latitudes. Ring currents encircle the Earth causing additional perturbations to the equatorial magnetic field. 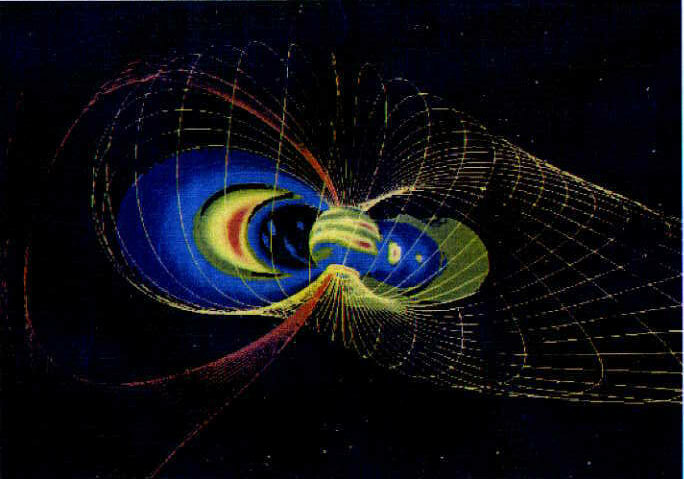 In addition, some corpuscular material and proton jets may penetrate the dayside magnetosphere and fill the inner and outer Van Allen radiation belts. At this point it should be recalled (Section 3) that although the geomagnetic field is usually considered to be located at the center of the Earth, it is actually displaced towards Indonesia. This displacement of the dipole causes field lines and radiation belts to dip more closely into the atmosphere over the South Atlantic than elsewhere. The effect is known as the South Atlantic anomaly. Spacecraft orbiting through the anomaly are more vulnerable to damage by the high-energy protons trapped in the radiation belts. (Indeed, more Single Event Upsets ((SEU) occur to satellite computers when they traverse this area than elsewhere). As a rough approximation, the intensity of terrestrial magnetic activity provides an indication of the energy dumped upon the planet by solar corpuscular action. A variety of magnetic indices have been devised, (some linear, some logarithmic) to indicate the magnitude of magnetic intensity (k, a, A, Q). The larger the value of the index the greater the effect on the ionosphere. It also correlates with the extent of damage that may be expected on spacecraft and human operations. Finally, on an integrated basis corpuscular energy slowly heats the atmosphere causing it to expand and increase satellite drag as the cycle advances. 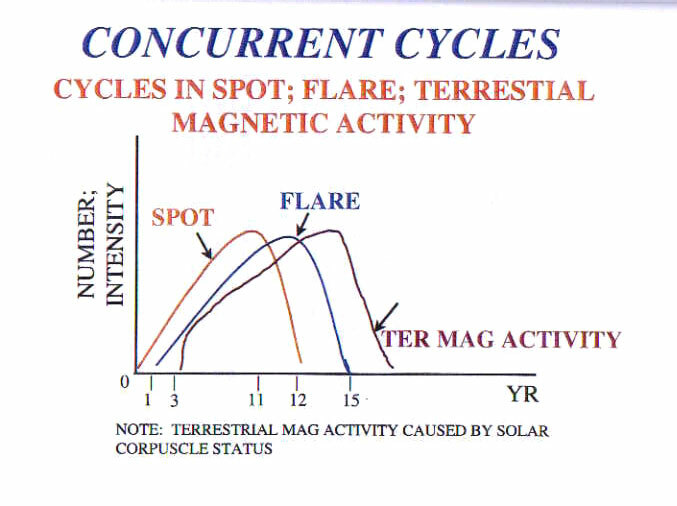 An interesting phase lag occurs between the maximum of the spot, flare, and magnetic activity cycles. The number of flares maximizes about one year after, and magnetic activity, about 2.5 years after, the spot peak (See Fig. 2.11). This lag implies that a "buffering condition" exists within the magnetosphere. Solar corpuscles are retained in this region and slowly dribble onto the Earth causing a delayed maximum in magnetic activity. 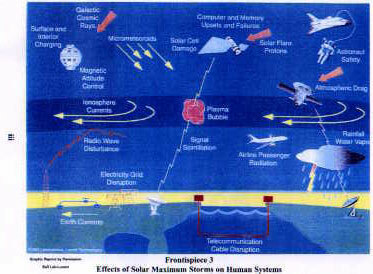 Some effects caused by the ionospheric current systems should be noted. The electrojets induce large currents on long north-south conductors (power-, rail- , pipe-, and telephone lines). During previous spot maxima currents to 10,000 amperes flowed in the Alaskan power grids and caused power outages in northern regions (Quebec, Manitoba, Minnesota, New York, Scandinavia, etc.). The more intense the corpuscular stream the lower the latitude on Earth that may be affected (Figs. 2.6-2.8). A value of Q=0 indicates quiescent conditions (no invading corpuscles) and Q=6, large-scale corpuscular intrusion. During the last maxima increased atmospheric drag on Low Earth Orbiters (LED) caused some to tumble out of control. 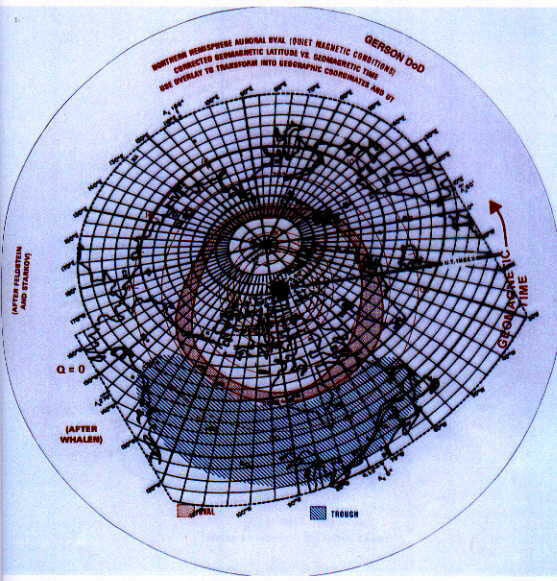 Headaches arose at radar tracking stations; many of the 40,000+ space objects tracked daily changed orbits and disappeared. Re-identification of space chunks was a time consuming exercise. A summary of the various effects of spot maximum on the medium is given in Table 2.1. Since the ionospheric layers will allow increased frequency support communicators will expand HF-ALE operations from 1-25 MHz to 1-40+ MHz. Manufacturers anticipating this increase are supplying off the shelf ALE equipment to about 60 MHz. The numerous jets of protons and corpuscles in the orbital plane introduce the hostile environment. Insufficient shielding of the spacecraft can allow penetrating corpuscles to damage circuitry, upset computer chips, and cause Single Event Upsets, (SEU). The increased corpuscular and proton streams can deteriorate solar panels this decreasing power input to spacecraft. Increased skin charging can allow arcing and thus lower the ratio of signal/noise. 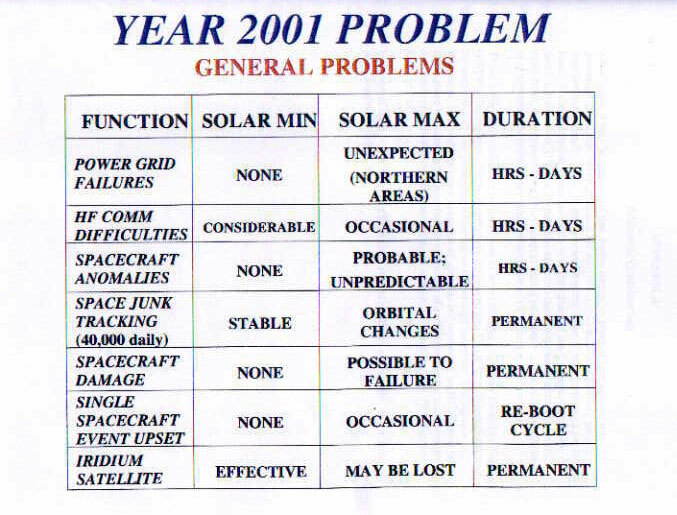 A summary of the problems, which may be encountered because of changes of the medium, is given in Table 3.1. 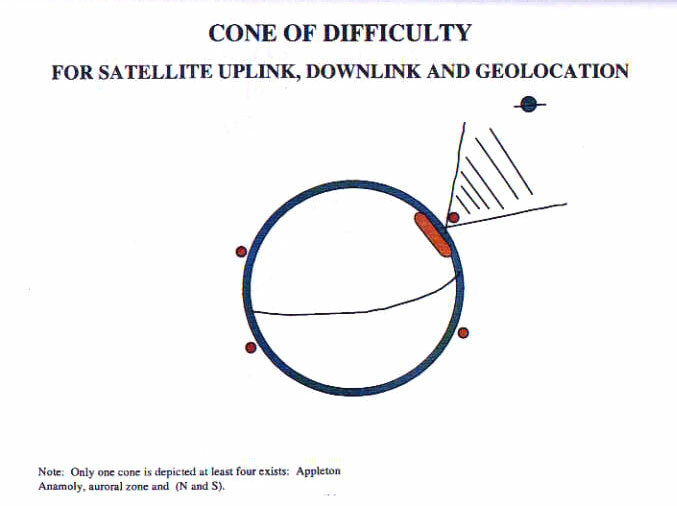 Several additional factors caused by the rising spot cycle unconnected with SIGINT may be noted in passing. It should be noted that with increased number of satellites the "collisional frequency" between spacecraft and proton jets will increase so that a greater number of satellites will be affected. At the present time about 500 satellites exist and the number within the next few years may reach 1000. Further, present cost cutting reductions for commercial satellites may well result in considerable communication failures because of decreased safety factors in satellite skins, circuitry hardening, chip hardening, power panel reductions, etc. 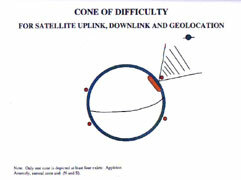 For satellites in networks the failure of a series of satellites may cause failure of the entire system. It may be of interest to list some additional items that occurred during the maxima of previous solar cycles. Some examples include power grid failures in northern latitudes; failure of Loran navigational systems because of lack of propagation; retinal flashes in astronauts causing them to seek radiation safe enclosures; excessive radiation to Concorde airline passengers; and extensive HF blackouts. 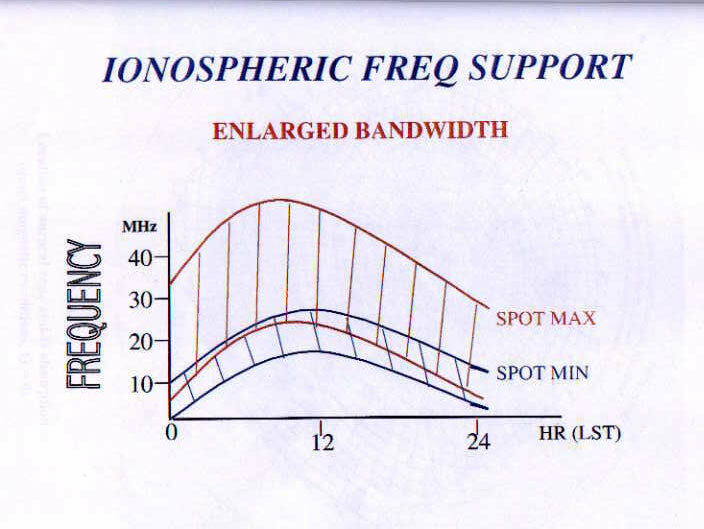 As an aside, it may be mentioned that during minimum years of spot activity the decreased ionospheric support causes HF communications to be more closely packed together in frequency. Also, all frequencies lie in the lower to mid-portions of the HF band. Since absorption varies inversely with the square of the frequency, a relatively minor solar burst of UVX of corpuscular radiation can disrupt many circuits. On the other hand, the expanded frequency support during peak years of the cycle permits users to move upwards in frequency where absorption of HF occurs sporadically. 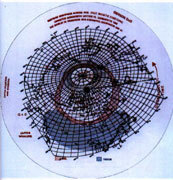 There is also some influence on the source of errors of High Frequency Direction Finding (HFDF). During spot minimum errors are introduced into HFDF by misidentification of the target signal; i.e., producing a bearing on the wrong transmitter. 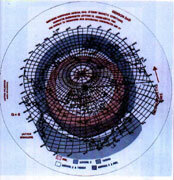 During spot maximum, however, the users have moved upwards in frequency. An HFDF error now arises more because of the independent variability of each layer and the juxtaposition of different rays arriving via different paths. A summary of the effects on HF collection is given in Talbe 3.1. 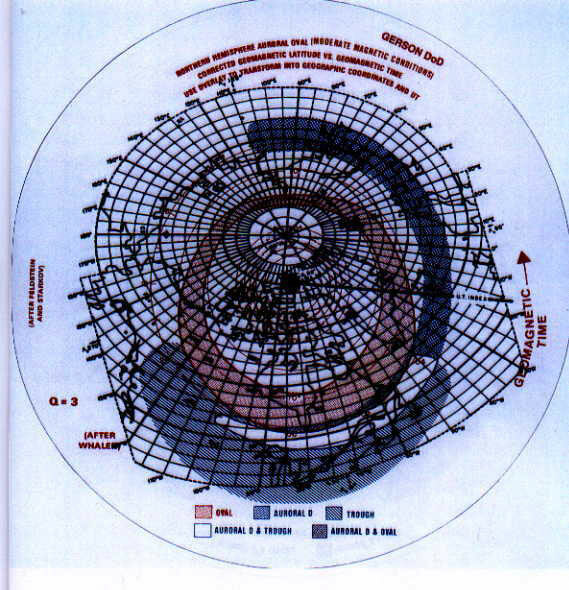 For general interest, the magnetic field lines around the Earth as distorted by the solar wind are shown in Fig. A.1.